Instant Kozhukattai Recipe / Sweet Rice Dumpling, kozhukattai is a Steamed rice dumpling stuffed with Fresh coconut, jaggery and cardamom. Rice Dumpling Recipe is Popular a sweet traditional christian dish for Easter season. 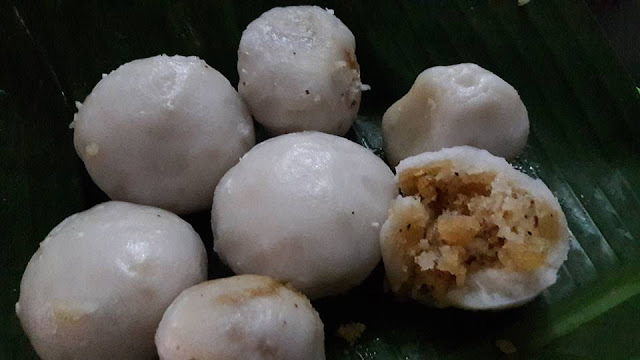 Kerala Christians prepare this dessert in Easter week. On that day keralite christens celebrate here a ‘Palm SUNDAY’ before a palm sunday , sataurday is Kozhukatta Perunaal. • Cut a jaggery pieces. Heat jaggery pieces with small quantity of water and melt it. • Mix rice flour with boiled water (use a wooden spatula or spoon). Make a soft dough form. Keep aside. • Shape dough in to small balls and keep aside. 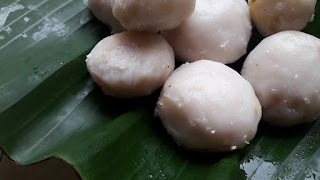 • Take one rice ball in your palm and flatten it to a small circle. • Place 2 tablespoon coconut jaggery stuffing in its middle. • Seal the circle evenly and make a small round ball. • Repeat the process until the dough and fillings are finish. Place each rice balls accordingly. • When all the rice balls are placed, cover and steam it for 10-15 minutes. • Turn off the heat. Serve cool or hot .